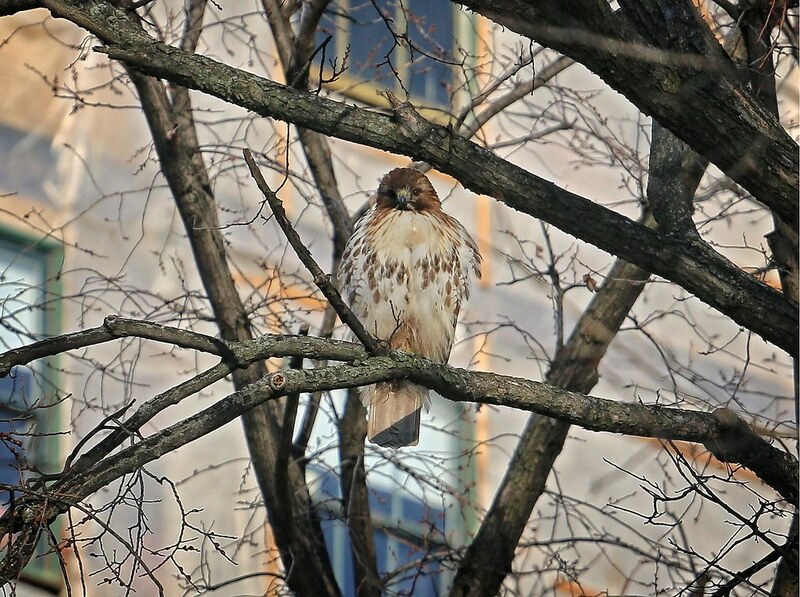 Christo's job is to provide food for himself, his mate, and his kids, so I often forget that Dora is also an accomplished hunter. She is much more secretive about her activities, so I really don't know how often she catches her own meals or where she goes hunting. On February 10, after observing Christo give Dora a love rat, I thought she would eat it. 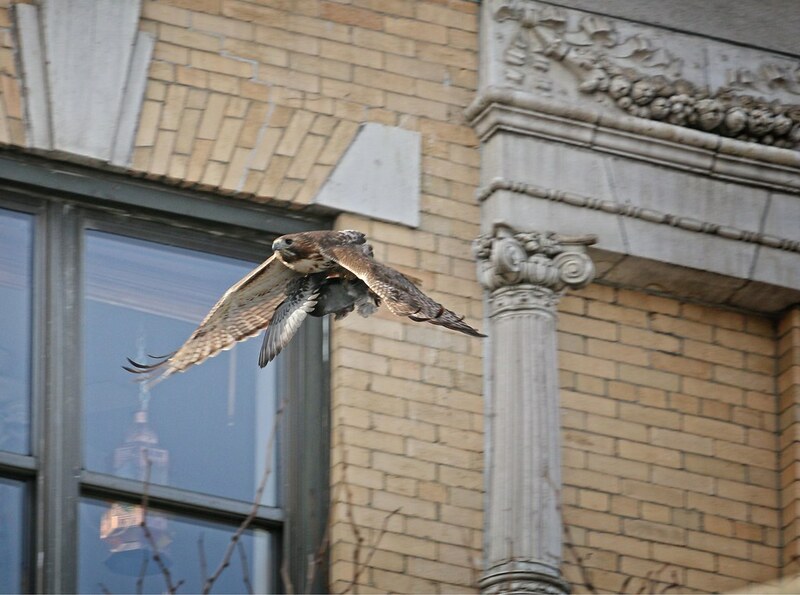 Instead, she stashed it in the tree and flew over to some cellphone transmitters on the roof of a building at Avenue A & St Mark's Place. 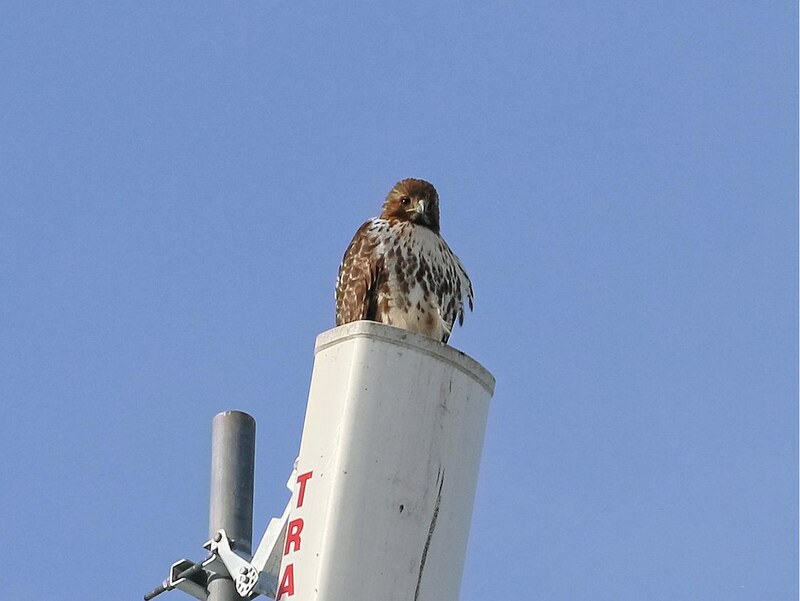 I've seen her perch there many times before, so I didn't think much of it. In the photo above, note how Dora is sitting behind the white structure. About three feet below her is the edge of the roof, which appears to extend about a foot towards the street. About seven feet below that is a fire escape. This image on Google maps shows the position of the transmitters in relation to the street. Unfortunately, a tree is blocking the view of the fire escape. 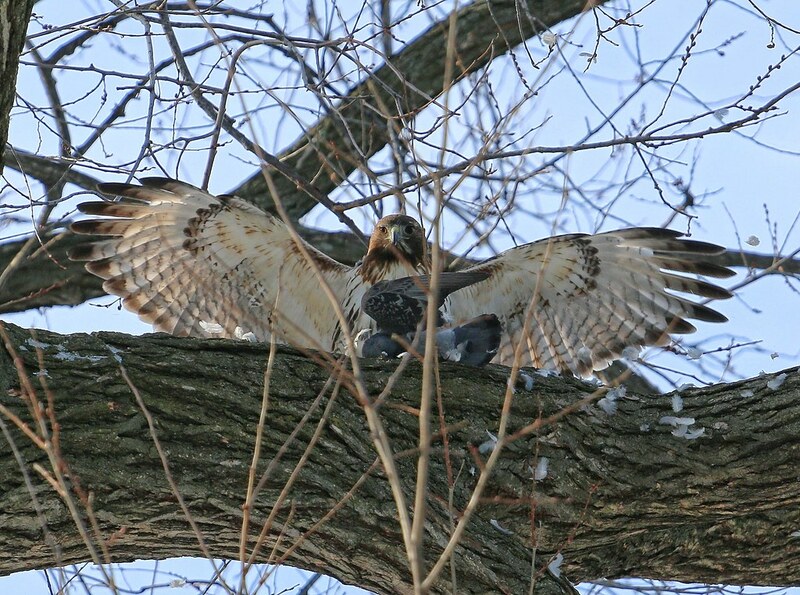 After perching there for about ten minutes, Dora made an unexpected move. 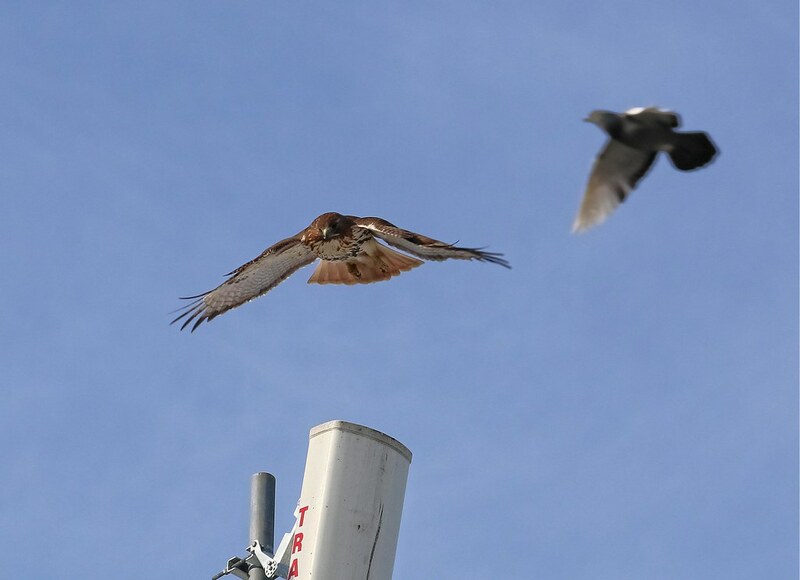 She suddenly leaped straight up, then dove over the transmitter. 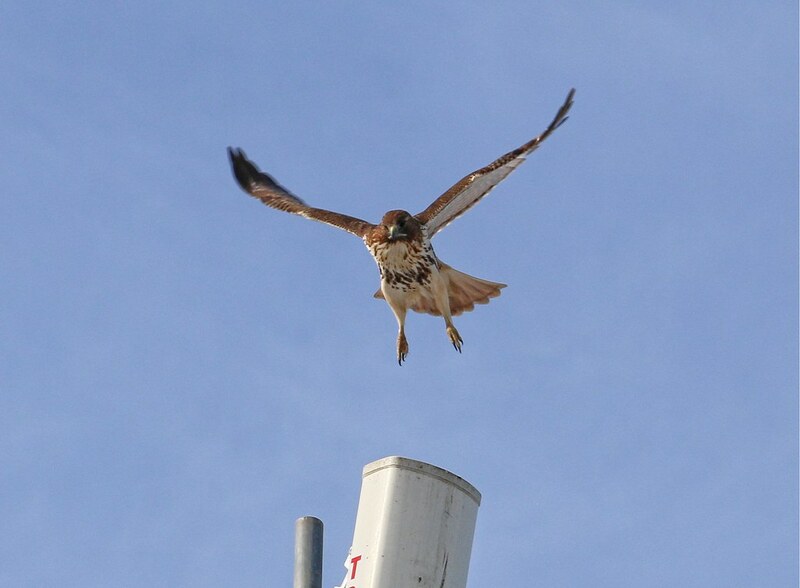 Normally, when the hawks take off, they look up or forward in the direction they're going. Note in the photo below how Dora's eyes are pointed down. Not even a passing pigeon drew her gaze. In an instant, BLAM! 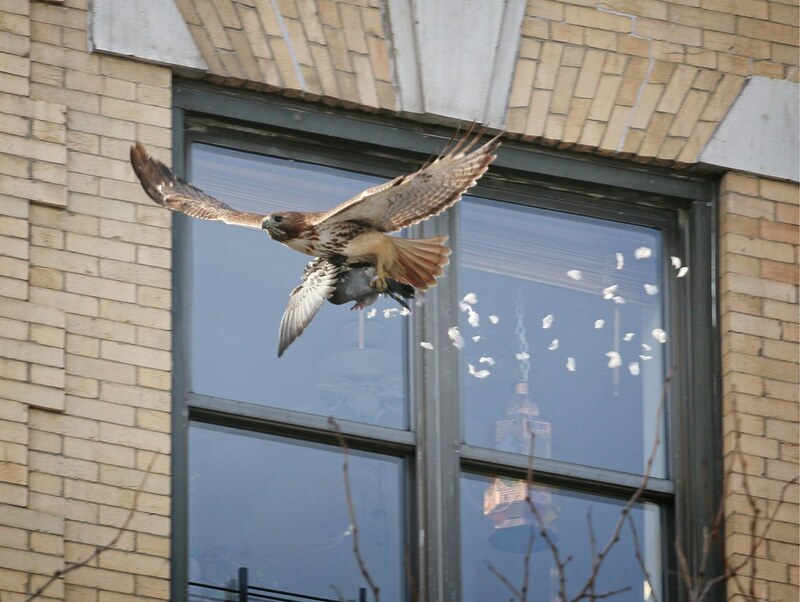 She grabbed a pigeon in mid-air as it took off from the fire escape below. How had she seen the pigeon below the ledge from her position above? She's badass! The whole sequence took less than a second. I was lucky to have already had my camera at my eye or I would have missed the whole thing. A half second later, the only evidence that anything had happened was a puff of feathers. 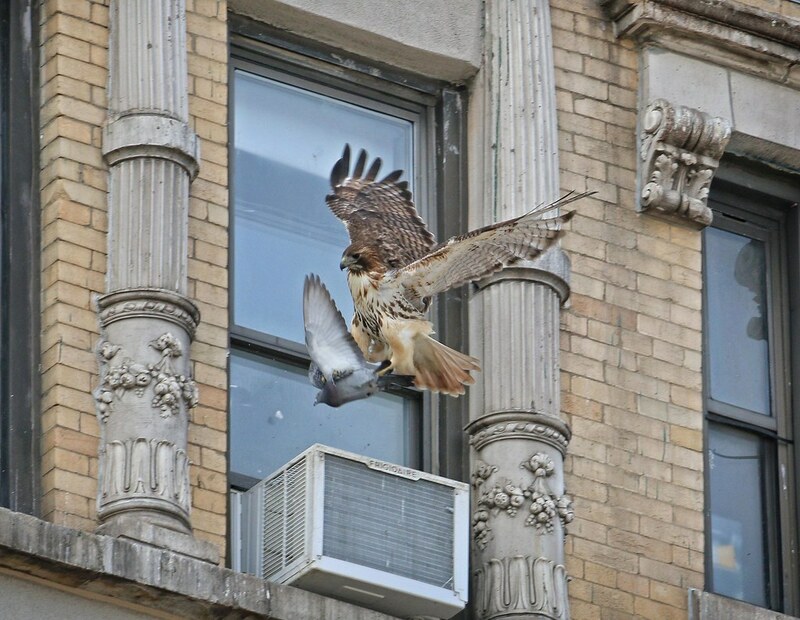 Dora took the pigeon to the big elm in the SW corner of Tompkins Square. In the photos above, you can see she held the pigeon by the tail, so she didn't have a very good grip on it and there was a bit of a struggle. 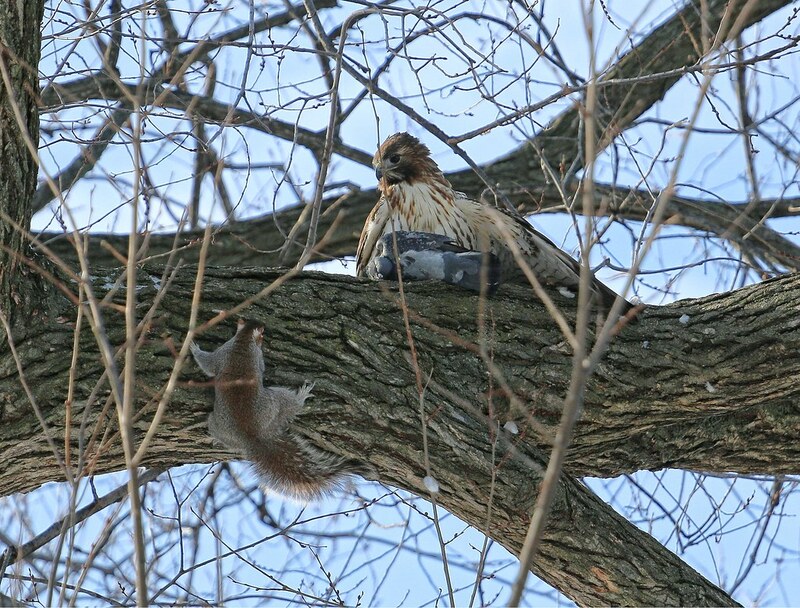 While Dora was busy subduing the pigeon, squirrels took advantage and harassed her. 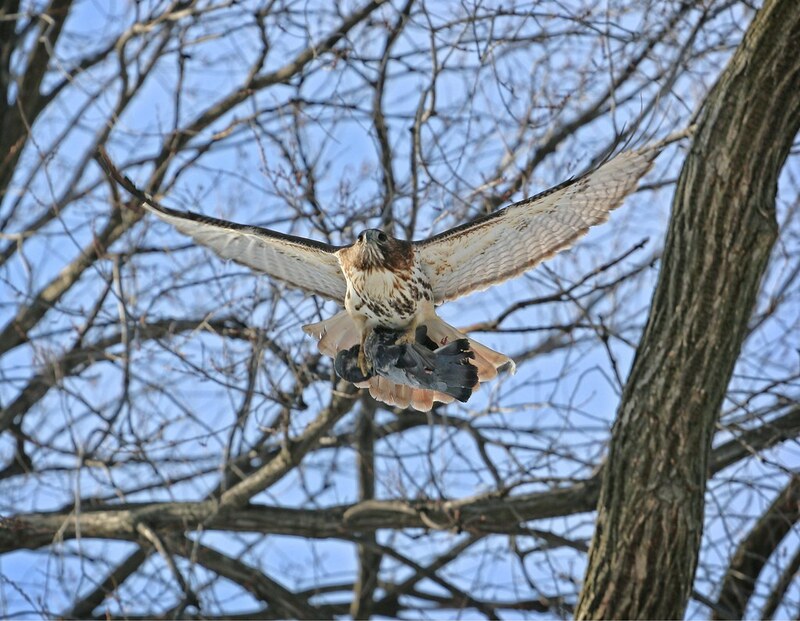 As the squirrels were being too aggressive, she got a better hold of the pigeon and decided to fly it to the opposite side of the park where she could eat undisturbed. 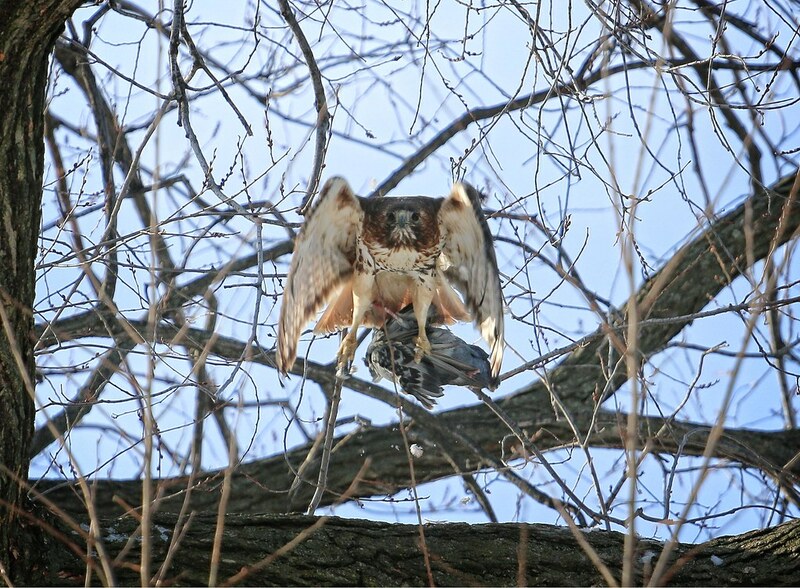 I was pretty excited to see Dora catch prey as I haven't seen her do that with my own eyes since 2014. 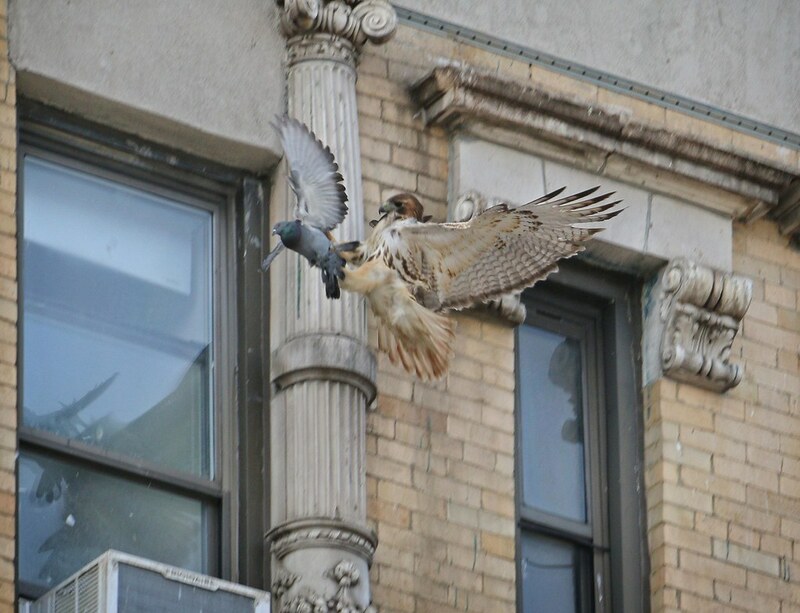 On that day, too, she didn't have a very good grip on the pigeon and it struggled, so I wondered if maybe her hunting skills weren't as good as Christo's. The spectacular dive she made off the roof, though, proved she's more than capable.